Very Good. Glued binding. Paper over boards. With dust jacket. 194 p. Do we want four-year-olds to watch slasher films? If not, who should decide? 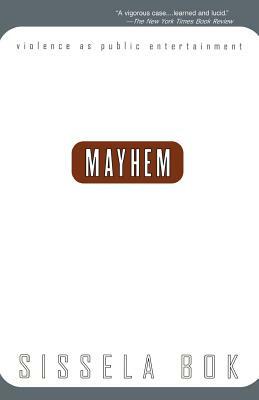 "Mayhem" lays out the ferocious arguments and the evidence on each side, as Bok reveals surprisingly ancient roots of the debate, from Roman critics of the gladiatorial games to restrictions on today's Internet. New. 0201489791 Ships from Tennessee, usually the same or next day. Very good in very good dust jacket. jacket in plastic cover, flaps taped; copy has minimal library markings; text and binding fine. Glued binding. Paper over boards. With dust jacket. 194 p. Audience: General/trade. Ex-Library Book-will contain Library Markings. Very good condition-book only shows a small amount of wear. Biggest little used bookstore in the world. Very good. The cover may have some normal wear. The text has no notes or markings.